t*rexes and tiaras: #frockswap15 - Chloe's parcel..
Oops, it's been a while since my last #FrockSwap15 post - back here when I styled Donna's bird dress. 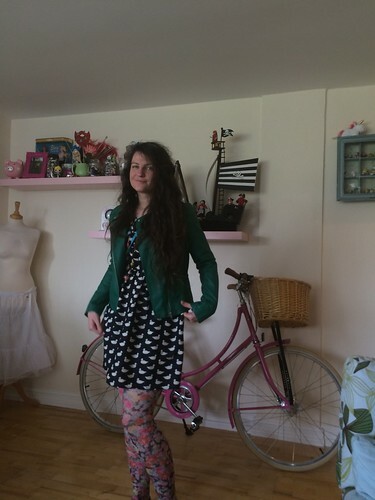 This outfit kind of follows the theme as Chloe's offering for our swap is this duck print dress. 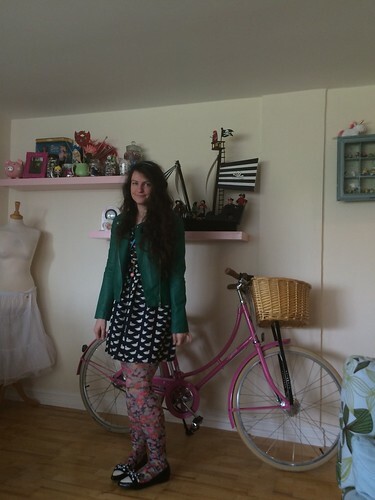 To style it up, I went for florals again, with these brightly coloured tights. I also went with a bright green leather jacket, so that the monochrome wasn't the only part of the outfit. My shoes, I kind of matched to the dress although the pretty little shoe clip bows are actually tiny elephants, not ducks. Close enough for me, though. How would you style up this dress? I'll be sending it on to Ally this week, so we can see what she does with it. Thank you. 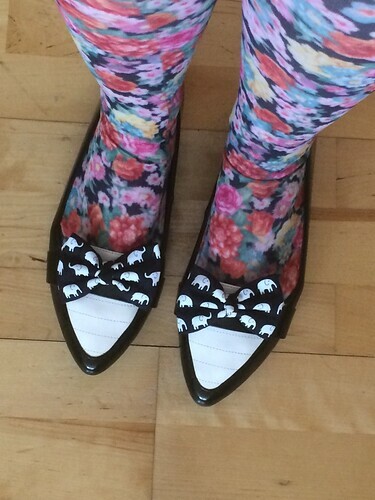 I do like to add a little wardrobe zoo to as many outfits as I can. This is such a nice concept,plus you look fab.